Chappaqua, NY – January 18, 2017 – Speaking in public can be stressful, scary – and pivotal to our success. Thankfully, like many things in life, practice makes progress. To kick off the New Year, Say It Media, Inc. announces new features and functionality to its app, LikeSo: Your Personal Speech Coach, to motivate, track and measure improvement in our speaking skills. LikeSo offers an engaging and effective way to train against verbal habits and practice speaking articulately, confidently, and without all of those “likes” and “sos.” LikeSo is available in the App Store for 99 cents for iOS devices. As with any kind of training, establishing goals and tracking your progress are key motivators to improving your skills. This new update introduces the ability to set Goals and Reminders for upcoming speaking opportunities (Interviews, Presentations, Speeches, Debates, Toasts, etc. 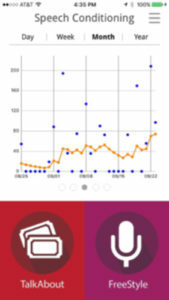 ), and the ability to view results over time (day/week/month/year). Like a fitness tracker for your speech, our new scoring system uses Speech Quality Points (SQP) and a Speech Conditioning Score (SCS) to help you achieve your speech fitness goals and ultimately improve how you speak! Say It Media is excited to announce our new partnership with the National Speech & Debate Association (NSDA), the largest interscholastic speech and debate organization serving middle school, high school, and collegiate students in the United States. NSDA plans to use LikeSo as an educational tool both inside and outside the classroom, and has contributed content to LikeSo’s Topic, Debate Team, with prompts based on current events and timely issues, all vetted by its educators and coaches. “We are thrilled to partner with the NSDA, an organization which for over 90 years has dedicated itself to creating the next generation of leaders,” said Mann Cronin. LikeSo offers two modes of play: TalkAbout and FreeStyle. TalkAbout is a conversation game with 12 Topics (The Job Interview, The College Interview, Debate Team, Pop Culture Favorites, Speed Dating, etc.) to practice speaking on the fly. FreeStyle is your open mic to practice for any upcoming speaking opportunities. Using voice recognition technology, LikeSo provides users with a real-time analysis of their speech fitness. The app calculates an Articulate Score grade (A+ thru Uh Oh!) based on a formula that looks at the percentage of non-filler words over total words spoken and your pace – with optimal pacing understood to be approximately 150 words per minute. As with any kind of training, establishing goals and tracking progress are key motivators towards improving your skills. Our new scoring system uses Speech Quality Points and a Speech Conditioning Score. Each time you play TalkAbout or Freestyle, you earn Speech Quality Points (SQPs) for that session. The more you practice, the more SQPs you earn. How many SQPs you receive is based on a formula that uses your percent of filler words over total words spoken, your pace, and your talk time (total minutes of speech). Our Speech Conditioning Score (SCS) provides a way for you to measure your training, set goals and achieve them! SCS is based on a formula that looks at your SQPs over the last 30 days and provides a daily score to indicate the “condition” of your speaking. The more you practice, the higher your SCS; go a few days without practice, and you’ll see your SCS decline. The National Speech & Debate Association is the largest interscholastic speech and debate organization serving middle school, high school, and collegiate students in the United States. The Association provides competitive speech and debate activities, high-quality resources, comprehensive training, scholarship opportunities, and advanced recognition to more than 150,000 students and coaches every year. For more than 90 years, the National Speech & Debate Association has empowered more than 1.5 million members to become engaged citizens, skilled professionals, and honorable leaders in our society. For more information, visit www.speechanddebate.org. Say It Media, Inc. was created to improve communications skills through practice with mobile apps. The company was co-founded in December 2015 by technology industry veterans Audrey Mann Cronin and Phil Lam–with assistance from its Chief Youth Officer, Audrey’s teenage daughter, Amanda. With a mission to create engaging and effective solutions, Say It Media, Inc. gives users a personal speech coach to train against verbal habits, while motivating, tracking and measuring their speech fitness. The company’s first app, LikeSo, hit #4 overall in the App Store for paid apps, and #1 in the Lifestyle category. LikeSo™ and Your Personal Speech Coach™ are company trademarks. Say It Media, Inc. is a partner of the National Speech & Debate Association. Visit us at SayItLikeSo.com, and on Facebook, Twitter and Instagram @ LikeSoApp.